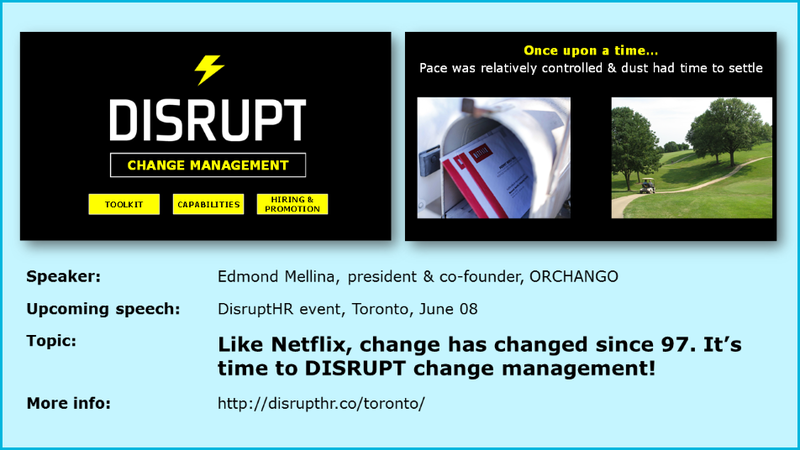 ORCHANGO co-founder & president Edmond Mellina will present Ignite-style at the DisruptHR event in Toronto (Canada) on June 08, 2017. The topic of his speech will be: “Time to DISRUPT change management!” (more details below). Like Netflix, change has changed since 97. It’s time to disrupt change management! MIT Sloan recently reported that “companies are unprepared for the disruptions projected to occur in their industry due to digital trends […] largely due to internal obstacles”. Fundamental issue: change has changed…. but HR continues to rely on change management approaches from the late 90’s / early 00’s. Back then, the pace of change was relatively controlled; the dust had time to settle before the next big change. That era is gone FOREVER. In our increasingly digital world, change is fast-paced, constant, disruptive and overlapping. Netflix provides a good analogy to illustrate how much change has changed. When Netflix was launched in ’97, it caused major disruptions to the movie rental business. Yet, if we could order a movie online, we still had to wait for the DVD to arrive via mail. Fast forward 20 years: once we order a movie on Netflix, bang, it starts streaming instantly. The pace of change has accelerated as much as Netflix’s delivery model. Move away from HR’s beloved centre-of-excellence model (change is a game of proximity). Ditch the step-by-step frameworks circa ’97 and adopt stethoscope-like tools.